This weeks Pay It Forward Mission Giveaway come from Whoop Tee. The winner will score 2 customized shirts for themselves and 2 customized shirts to pay it forward with. WhoopTee is a St. Louis-­based custom t-­shirt screen-printing company focused on retailing the finest in t-shirt quality and comfort, as well as leveraging technologies that make custom designing easy, affordable and accessible to consumers. Customers can upload any image desired, and with a number of cutting-­‐edge printing techniques,WhoopTee can transpose literally any image onto a shirt. Coupled with excellent customer service, affordable prices and rapid delivery time, WhoopTee is among the best in the custom apparel industry. For more information about WhoopTee, log on to www.whooptee.com. 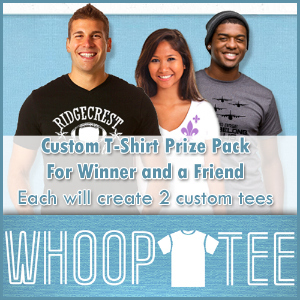 Our winner and a friend will each receive a $50 WhoopTee credit to create 2 custom t-shirts each. Dirty Jobs Mess Masters contest!